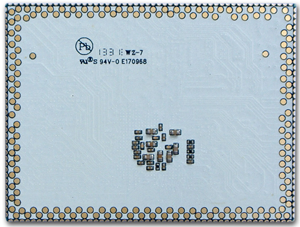 Measuring only 61mm by 46mm, the MYC-S5PV210 CPU Module is a highly-integrated stamp module based on 1GHz Samsung S5PV210 ARM Coretex-A8 processor which provides state-of-the-art 3D performance and a rich collection of multi-media support while achieving the lowest power consumption and integrates a 1080p full HD codec engine that supports 30fps full HD video playback and recording. 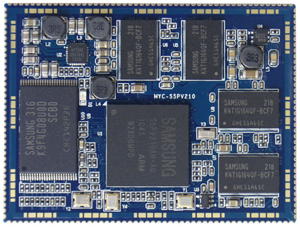 The board has integrated with 512MByte DDR2 SDRAM and 512MBbyte Nand Flash to form a minimum embedded system. 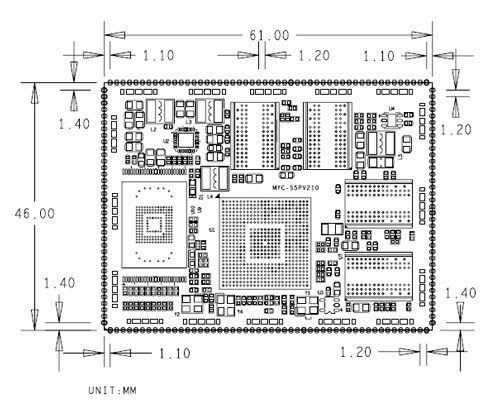 MYIR offers custom design based on this CPU module. Please contact MYIR for your inquiry.